Last week, leakers claimed to have screenshots of the final character and stage rosters for the upcoming Super Smash Bros. games. Today, some rather convincing videos have popped up that appear to confirm the veracity of that leak, showing off some exciting unannounced characters from the highly-anticipated Nintendo fighter. 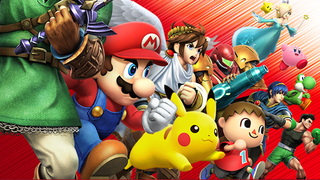 Warning: the following post contains potential spoilers for the upcoming Smash Bros. games. New characters in the alleged leak include Bowser Jr. (with clown car! ), Shulk from Xenoblade, and the dog from Duck Hunt. The leak also features returning characters who have not yet been announced, like Ness and R.O.B. At first, we weren't convinced enough of the veracity of this leak to feel comfortable publishing these screenshots on Kotaku, but today, some very convincing videos have popped up on YouTube, using that same name that's on the first character screen: ESRB0083. The name ESRB0083 seems to indicate that this build was designed for the Entertainment Software Rating Board, which judges and rates video games, but the ESRB does not typically play the games they rate, so it's likely that this purported leak came from someone at Nintendo. We've reached out to Nintendo for comment and will update should they have something to say.